Since 1992 Richard and Kathy McDonald have been the voice of God's love, hope and peace to thousands living in the war-torn region of the Democratic Republic of Congo (formerly Zaire) and the bordering nations. 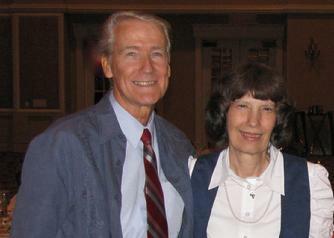 They have been serving as missionaries with Believer's Express Service, Inc. (BESI) since 1986. Their story is captivating. The founding of Radio Kahuzi in July of 1991 serves as an example of persistent commitment to a vision. Through 40 years of service together the McDonalds have witnessed the Spirit of God at work transforming lives, even to the point of averting bloody massacres. They endured mortar attacks on their radio station, faced the barrel of a gun, and suffered hardships for Christ. Both personally and over the air they have been messengers of hope for those who face the ravages of war, poverty and disability. Tropical band short-wave 6210 was added in February 2001. With the addition of a 1,000 watt short-wave transmitter we are reaching a large portion of Central Africa and beyond with a potential audience of an additional 10 million listeners. Reports are coming in daily from new listeners. Government officials have returned from their travels to Moba, Kisangani, Goma, and Bunia within the Democratic Republic of Congo and report an excellent signal. Other reports have been received from the countries of Uganda, Tanzania, Kenya, and Darussalam, and as far away as South Africa. Recently Radio Kahuzi has had the opportunity to minister to the Rwandan refugees and the rebel militia who are hiding in the jungle through radio broadcasts. Requests have been sent from two commanders of the rebel militia asking for more Galcom radios in order to listen to Radio Kahuzi. God is doing a mighty work through this little radio station in the jungle! Please pray that these rebel soldiers will come to the saving Grace and Knowledge of our Lord Jesus Christ! Believer's Express Service, Inc., (BESI) was founded in 1986. HCJB World Radio signed on as partners to provide the transmitter equipment in 1991. The studio and FM transmitter were presented to the McDonalds in June 1992. The ultimate goal is to form a national network, and an international short-wave outlet from Bukavu. The McDonalds have established over 300 local Radio Kahuzi Clubs with over 10,000 members. Each club elects a president to represent its members. The president and several members from each club coordinate and work with one of our journalists, to submit reports and evaluate the well-being of the club members and their village needs on a regular basis. Since 1992, with the help of our partner, GALCOM International, we have distributed over 17,500 GALCOM solar-powered, fix-tuned radios to some of the most devastated and remote villages. God has given us a wonderful open door using FM and short-wave radio to broadcast the Gospel of the Grace of God to countries and peoples unreached by other means. We covet your prayers and your partnership, and trust you will choose this as your missionary radio outreach in the Democratic Republic of Congo from Bukavu! Christ’s last command to evangelize the world should be the great concern of every Christian. It is a pleasure to introduce this fine story of the labors of some of God’s choicest servants in the Democratic Republic of Congo, formerly Zaire. The ministry of Mr. and Mrs. Richard McDonald has been remarkable. Mrs. McDonald’s father and mother spent years laboring in Zaire, and then saw their daughter and son-in-law take up the reins and so ably carry on. The venture of establishing a radio station, encouraged by missionary stations such as HCJB Global, formerly HCJB World Radio Fellowship, and others, looks to the future, not only in D. R. Congo, but also in the entire continent of Africa. I trust reading this will spark a burden of prayer for this ministry.